As someone who loves to host themed parties, I’m a big fan of doing it on a budget. 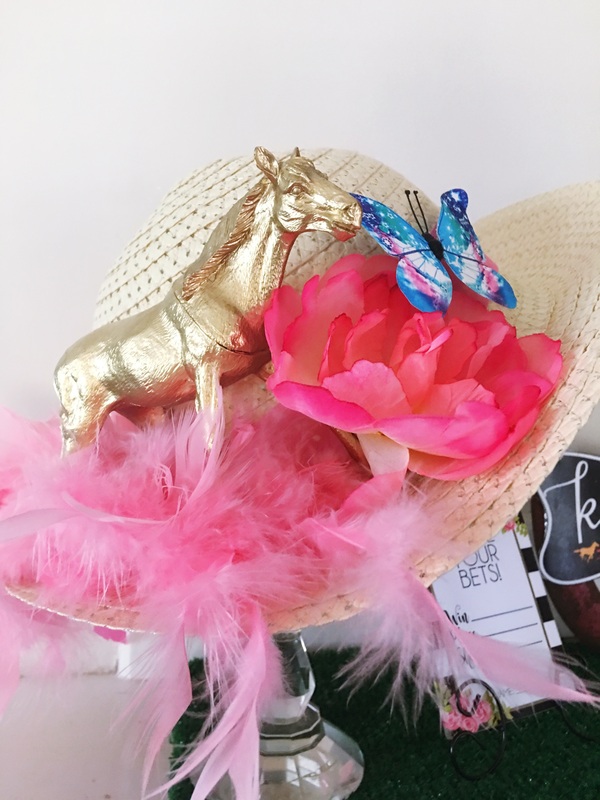 The first place I always head to shop for inexpensive party decor is Dollar Tree. 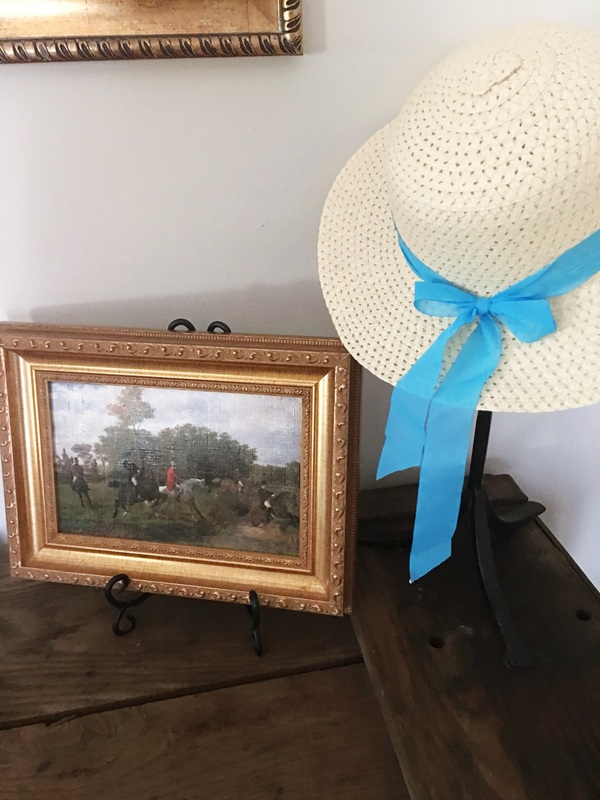 I love being able to repurpose things by doing a quick DIY. You don’t have to spend a lot to make it look like a quality event. 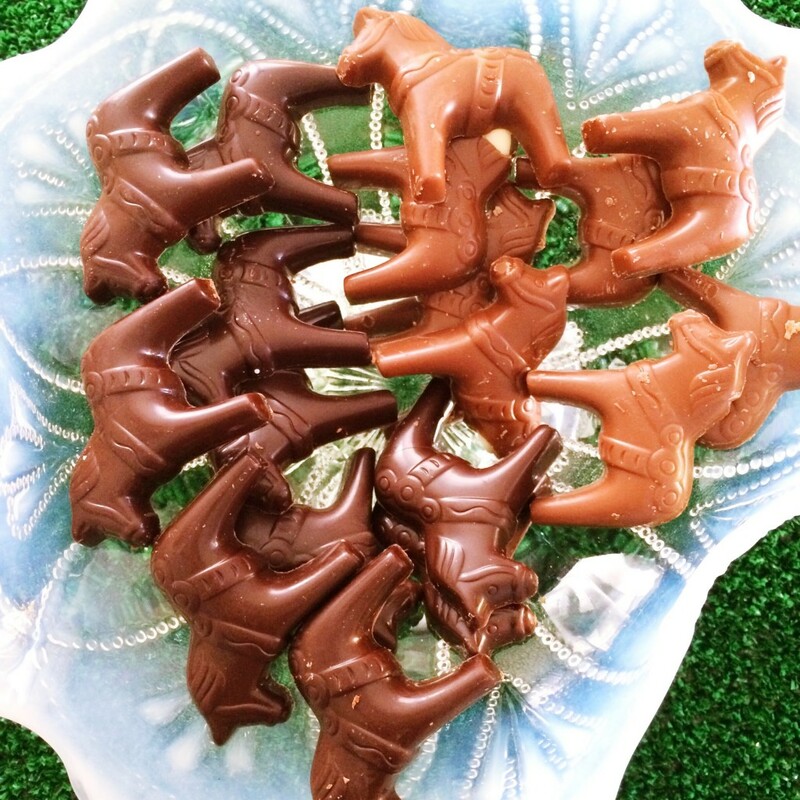 I love these toy horses there. A quick spray of gold spray paint and it’s instantly glammed up! I also picked up the blue ribbons there from the baby shower section. I printed out some horse clipart and glue it onto the ribbon. Done in 1 minute! 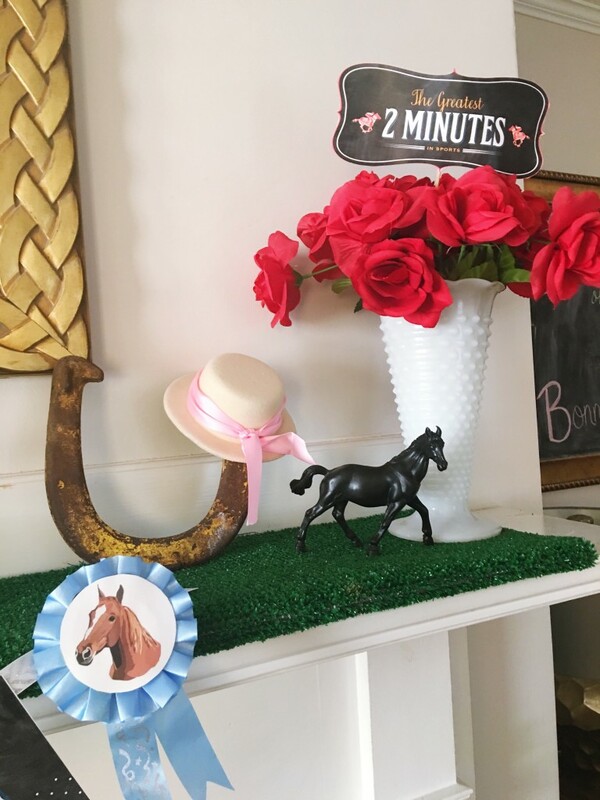 This year, I made a super fast and super easy horseshoe shaped rose wreath for the mirror above the mantle. 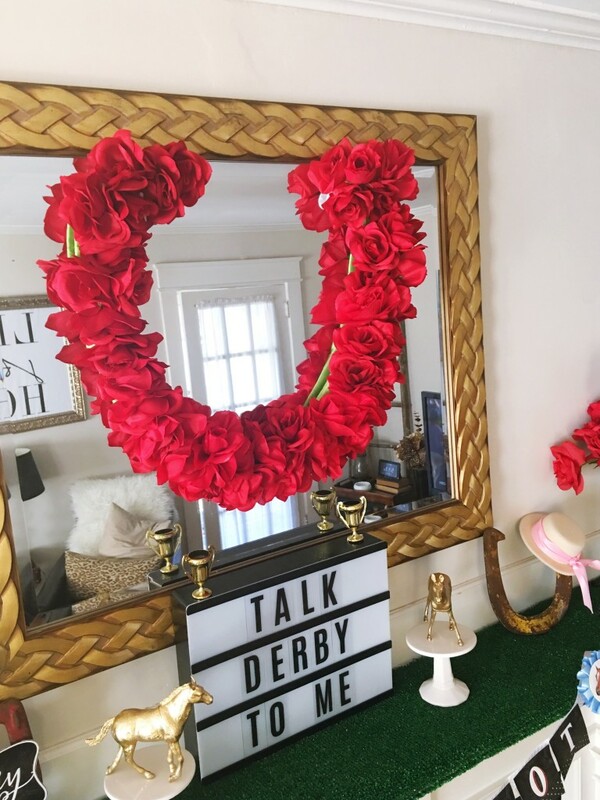 I bought a piece of foam board from Dollar tree and about 10 bunches of roses. I drew out a horseshoe onto the foam board then cut it with a box cutter. Next, I wrapped the shape with green ribbon so the white wouldn’t show through. I then pulled the roses off the stems, put a drop of hot glue on the back and stuck it on the board. The whole thing took no longer than 15 minutes and I love the way it came out. 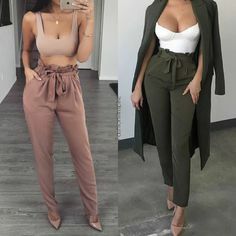 Little bit of money but big impact. There are tons of free printables for almost anything imaginable online. One of my favorite sites is Hostess with the Mostess. 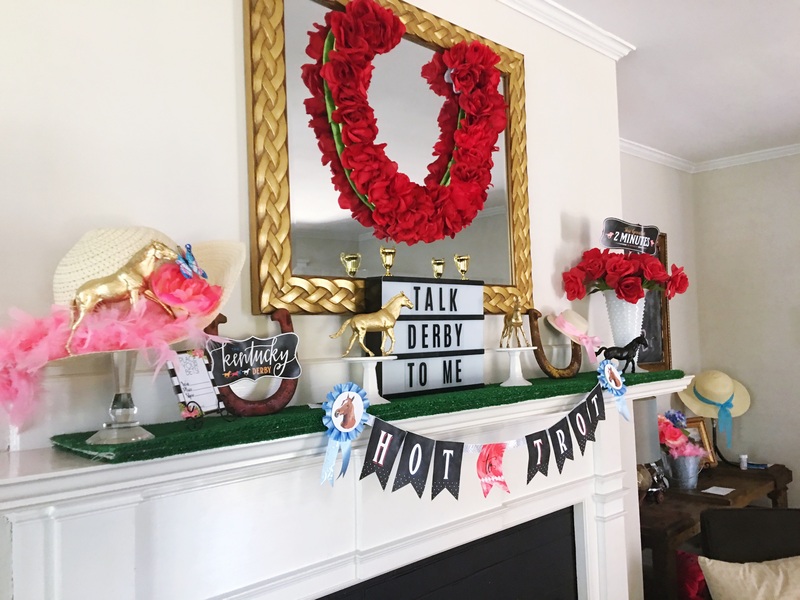 For my party, I’ve used both sets of her free Kentucky Derby printables. She updates them every year too, which is great. In my opinion, signs and other printables make a party. They add so much character and personalization. Themed food is a must! 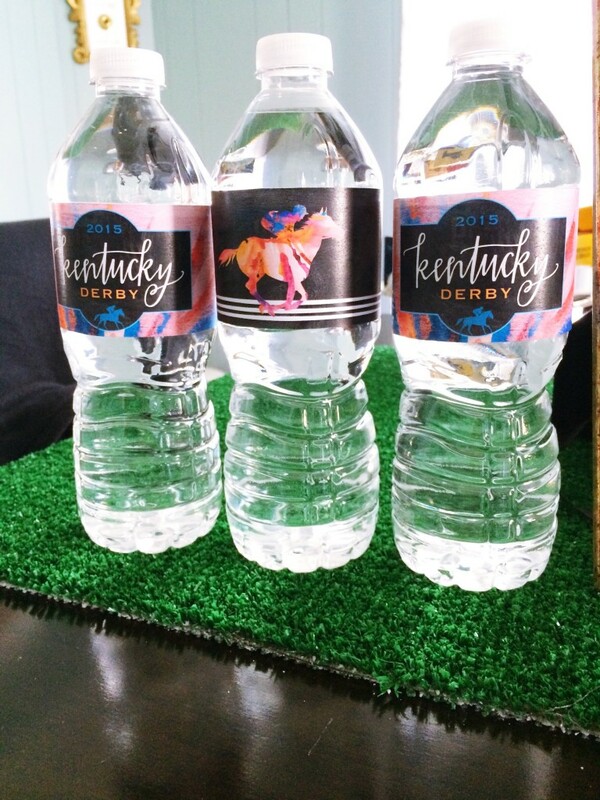 I searched Pinterest for easy and classic Kentucky Derby recipes. 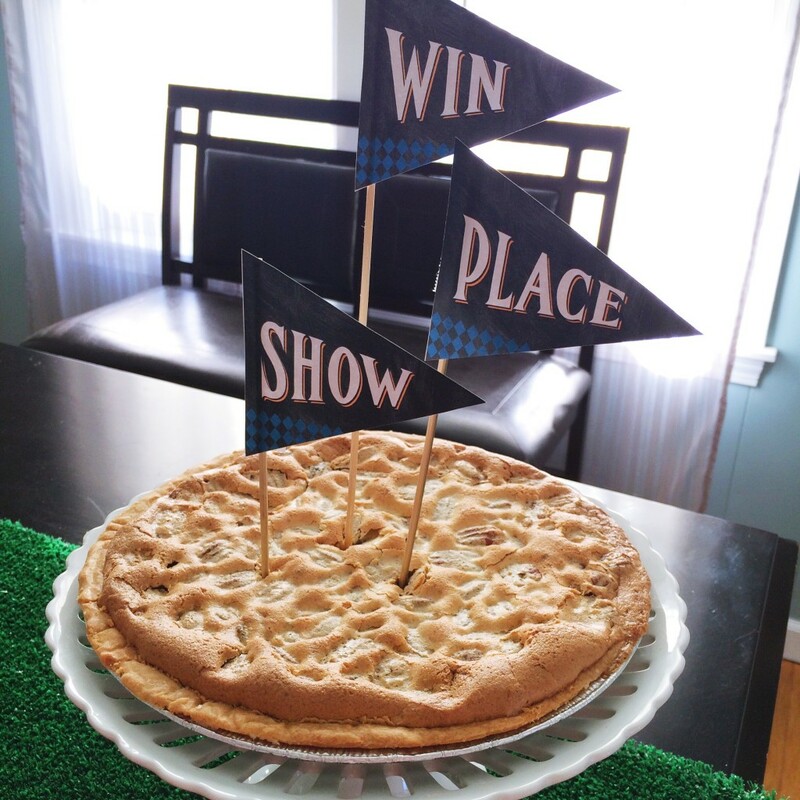 My dad makes an amazing Derby Pie. I look forward to it every year. I like to keep the main food easy because I like to be able to enjoy the party and my guests. Meatballs in a crock pot with a bottle of bourbon sauce is easy and right on theme. I also make a bow tie (get it?!) pasta salad, mini Kentucky Hot Browns and a Benedictine spread. Instead of Mint Juleps, we make Wine Juleps! White wine, muddled mint and ginger ale. I mix it all in a pitcher and let guests help themselves. I’ll also be serving sweet tea and lemonade because what’s more southern than that? Engage your guests! 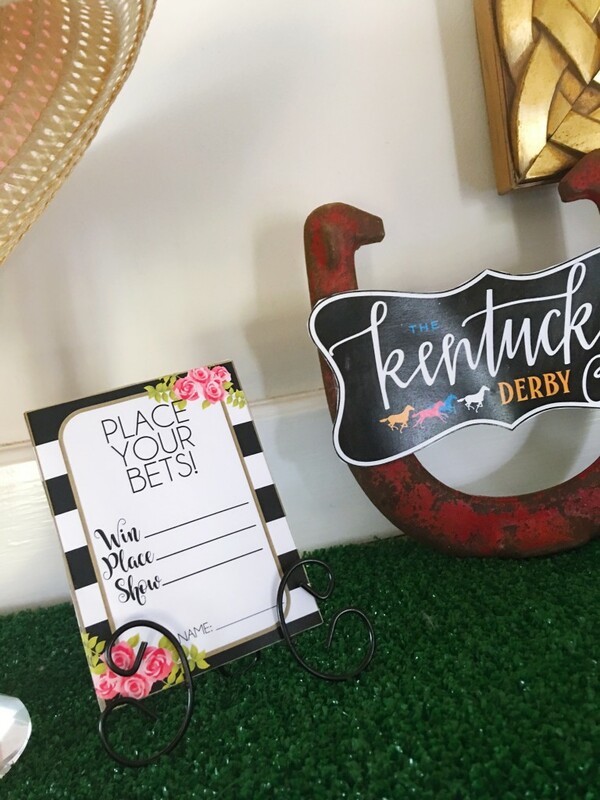 We have a pool where anyone who wants to participate can throw in $10 and pick their favorite horse to win. Winners split the pot. 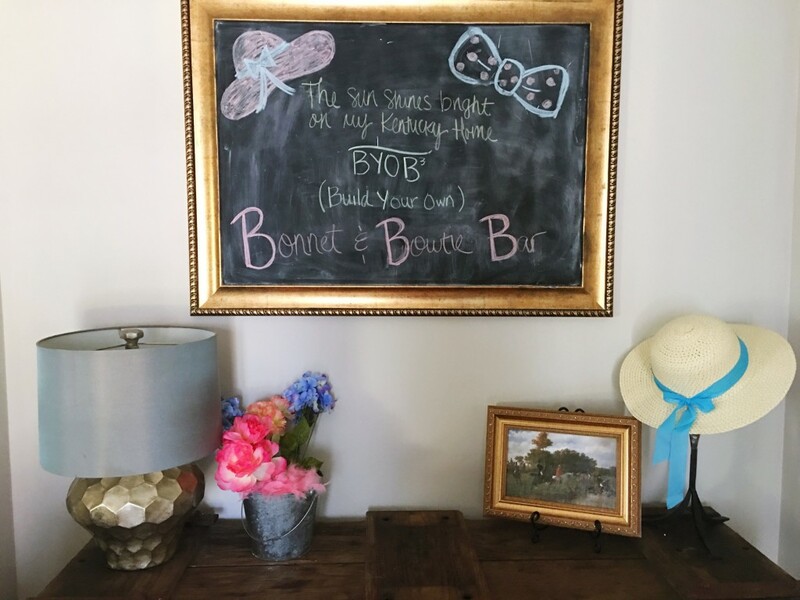 This year, I’m also adding a BYOB3 aka a Build Your Own Bonnet and Bow Tie Bar! Once again, I hit up Dollar Tree for more inexpensive party items. This time of year is easy to find Spring hats. I bought a few, along with more fake flower bunches and even a couple of feather boas for ladies to decorate hats. After the holidays, I found fun patterned bow tie gift tags and can easily be made into a wearable one for the guys (and gals) with a little bit of ribbon! Think outside the box! The first year we hosted, I went to Home Depot with a strange request. I needed enough astro turf to cover my dining room table. The girl thought it was a little strange but when I told her why I needed it, she encouraged me to take some of the square astro turf samples they had to use as coasters! Genius! Little details like that make all the difference. Party favors! Favors should be simple and go with the theme of your party. 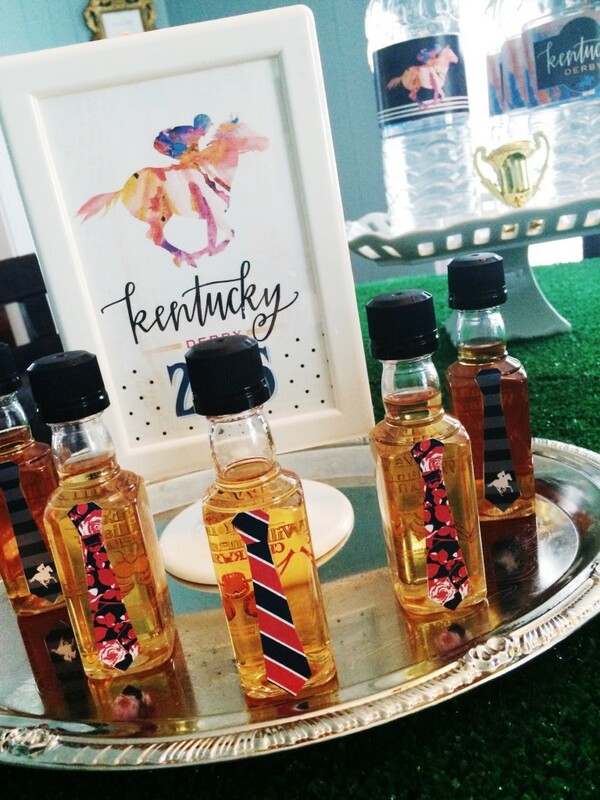 Last year, I gave out nips of bourbon and attached the necktie printable from Hostess with the Mostess. Easy and so cute and great if you’re last minute (like I was)! You can check out our 2015 party here! 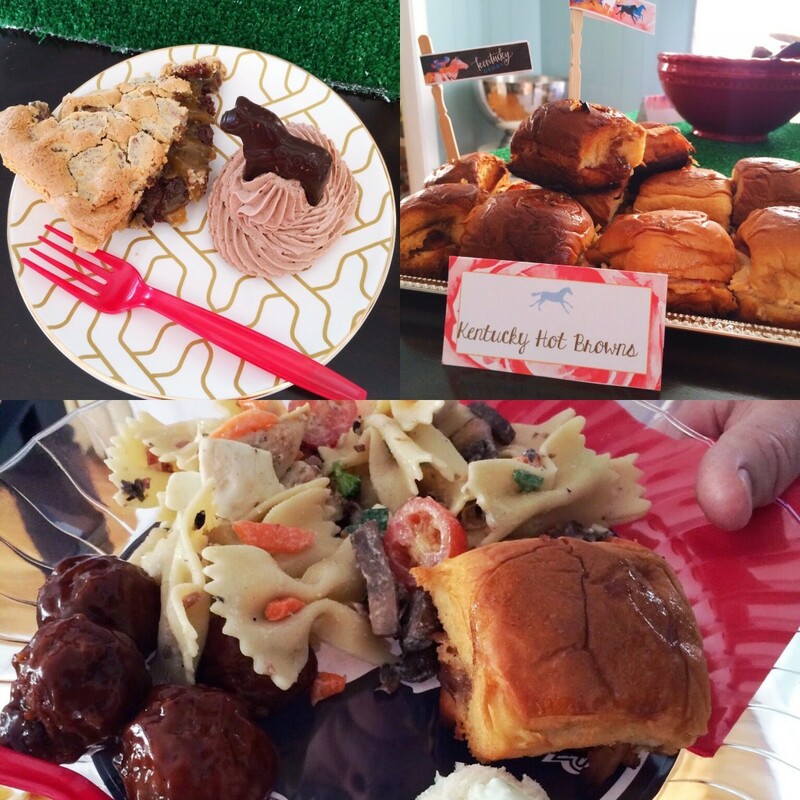 If you’re hosting your own party this year, I’d love to hear some of your ideas as well! 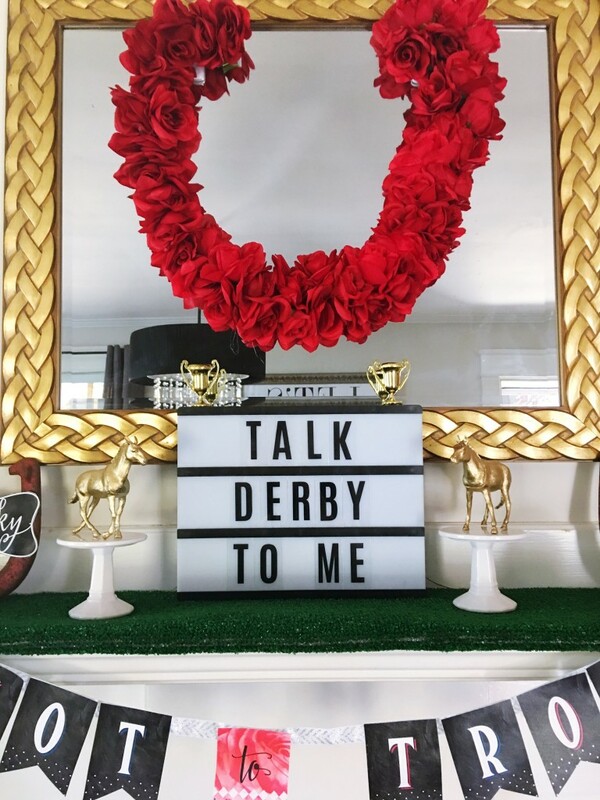 Happy Derby Day! 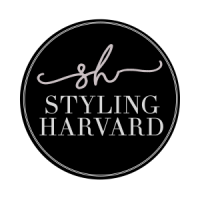 Previous Post Styling Harvard: Happy Easter!